We’ve been waiting as patiently as possible for the chance to learn more about the new 2017 Honda Civic Si. After being told that we could expect this model, we were left high and dry with no information on what to expect—up until now. That’s right, Honda has finally indulged us and released some information about the new Si, and we’re excited to share it with you. Keep reading to learn what we found out. The first thing that we noticed when looking at first-look evaluations of the vehicle was the incredibly attractive exterior of the 2017 Honda Civic Si. The exterior is a bold, yet sleek and sporty design that is sure to make sports car lovers swoon. We also noticed that there will be both two-door and four-door options, giving drivers the freedom to choose from a sporty coupe style or a slightly more spacious sedan. Regardless of the choice, the exterior is made up of a few key components that make it stand out so boldly. These features include a center-outlet sport exhaust system, front splitter, rear wing, and 18-inch machine-finished alloy wheels. What sporty vehicle is complete without a powerful and aggressive powertrain configuration? Not the 2017 Honda Civic Si. The Si incorporates a 1.5L turbocharged engine with the power to dole out up to 205 hp and 192 lb-ft of torque. This amount of power is sure to be a crowd pleaser. The vehicle also comes with limited slip differential for better handling and an adaptive damper system for increased stability. When you put it all together, the 2017 Honda Civic Si shows great potential as a sporty vehicle ready to take the automotive world by storm. 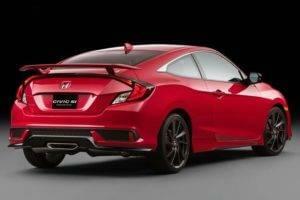 This is only a small glimpse of what we can expect from the 2017 Honda Civic Si. Be sure to stay tuned as we continue to update you on the vehicle as more information becomes available. While you wait, take a quick trip to Central Illinois Honda Dealers to explore our currently available models and learn more about financing options and our currently running offers.